The Library of Congress has long collected original cartoon art so that scholars, fans, and the general public may study, understand, and then share information about the Ninth Art. The Prints & Photographs Division makes more than 125,000 original cartoon drawings and prints available to researchers in person in its reading room. It has scanned selected works to improve access to those who cannot trek to Washington, D.C., to see them in person. In addition, the Library encourages researchers to use millions of cartoon images through its vast holdings of such print publications as periodicals, newspaper microfilm, comic books, and book compilations. The Library of Congress, founded in 1800, serves as the national library for the United States as well as an information resource for Congress. 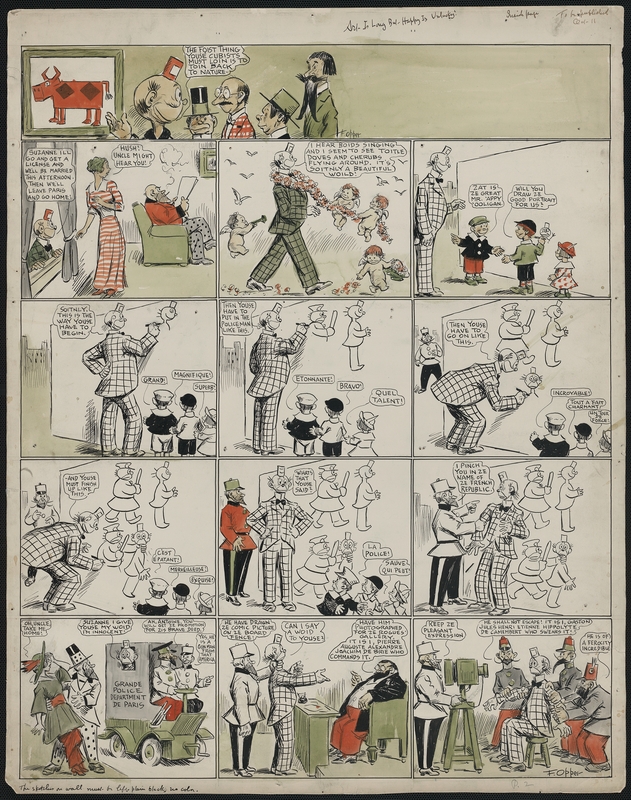 Since acquiring a large trove of copyright deposit satirical prints in the nineteenth century and 10,000 British cartoon prints in the 1920s, special attention has been devoted to cartoons as works of art on paper. 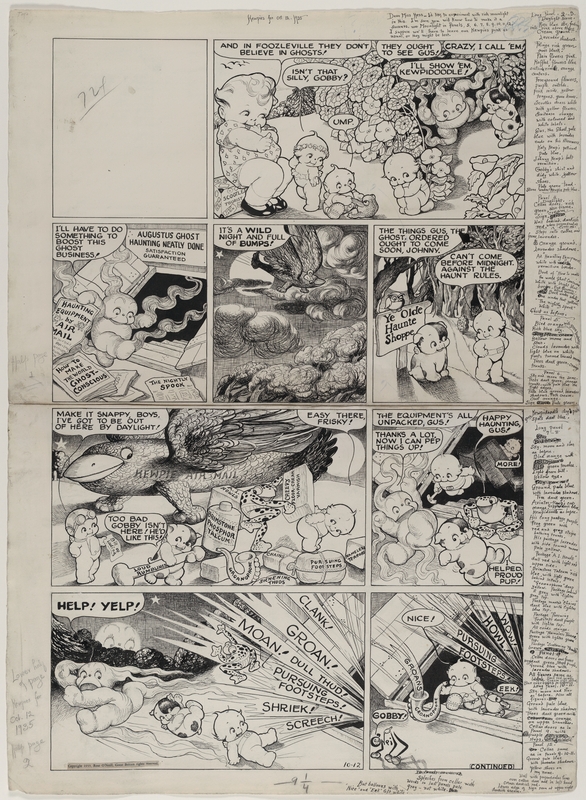 The Library has reached out to individual cartoonists to acquire original drawings and also taken on impressive collections compiled by Caroline and Erwin Swann, Art Wood, Ben and Beatrice Goldstein, and Herblock. From the late 1600s to the present day, on just about any topic you can name, the Library has cartoons. Studying the art form and content of these original works of art on paper has been an exciting experience for people who visit the Prints & Photographs Division from many different countries. In 1996, the Library acquired a scholarship program, the Caroline and Erwin Swann Fellowship Fund, which it uses to actively seek out young scholars to visit the collections in person and share their research in a public forum. For senior academics, Kluge Fellowships are another option to obtain supported research at the Library of Congress. Finally, the Library has had exhibition space dedicated to caricature and cartoon for several decades, so that we can give any Washington visitor immediate access to original cartoon drawings. Others may take advantage of our online versions of cartoon and caricature exhibitions dating back to 1997. The Library encourages researchers to examine its collections because original cartoon art provides information not present in the published version. Often there is a dialogue, between artist and writer, between artist and colorist, or between editor and artist, which is not conveyed in the final version. The creative spark may be beautifully rendered in the print version, but if one were interested in fully understanding the art and collaboration that went into its creation then one must look at the original. Steve Ditko, artist, and Stan Lee, author, ‘Spider-man!’, . Original drawing for: Amazing Fantasy, 15 (1962 Aug.), p. 3. CD 1 – Ditko, no. 1c (B size). LC-DIG-ppmsca- 18749, http://www.loc.gov/pictures/item/acd2008000005/PP/. © and TM Marvel and Subs. The roof support is altered in the car that nearly hits Peter Parker, who leaps into the air. 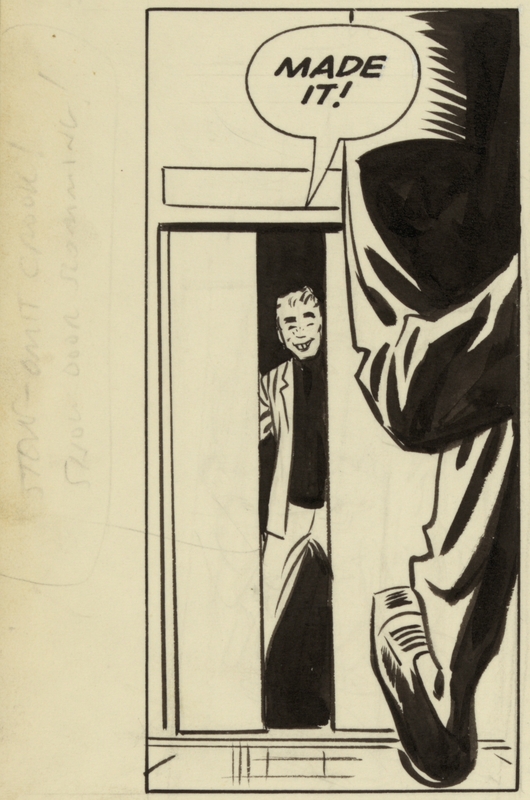 Dialogue and alterations, either approved or ignored by Ditko, appear throughout the story, including an ignored message not to show the crook’s face on page 8 of the story. The alterations are seamless in the print version. Steve Ditko, artist, and Stan Lee, author, ‘Spider-man!’, . Original drawing for: Amazing Fantasy, 15 (1962 Aug.), p. 3. CD 1 – Ditko, no. 1h (B size). LC-DIG-ppmsca- 18754, http://www.loc.gov/pictures/item/acd2008000005/PP/. © and TM Marvel and Subs. Comic strip artists, like comic book creators, collaborated with several people to create their unique look. Unlike comic book creators, few received visible credit in the final print version. The role of the colorist in the creation of beautiful Sunday newspaper comics pages has been forgotten, but in the early decades artists experimented with color and often used watercolor to indicate to the colorist how the page should appear. Some artists, including Frederick Opper, partially rendered their Sunday pages with watercolor to indicate the palette. Frederick Burr Opper, artist, [Happy Hooligan]. ‘Art is long, but Happy is unlucky!’ October 11, 1914. Original drawing. PR 13 CN 2001:055-4. LC-DIG-ppmsca-06588, http://www.loc.gov/pictures/item/2004676896/. Art Wood Collection of Cartoon and Caricature, Library of Congress. However, in the case of Rose O’Neill in her cute children’s comic strip Kewpies, used her colorist to full advantage. In one drawing in the Art Wood Collection, she wrote a long letter to her colorist, Miss Hess, in the margins of the drawing, giving her extended instructions for the experimentation in color she intended to gain the rich moonlight effect she intended, implying that Miss Hess played a full role in its creation. Rose Cecil O’Neill, artist, Kewpies. ‘And in Foozleville they don’t believe in ghosts!’, October 12, 1935. Original drawing. PR 13 CN 2003:133. LC-DIG-ppmsca-08333, http://www.loc.gov/pictures/item/2005680576/. Art Wood Collection of Cartoon and Caricature, Library of Congress. Comic strip artists often use multiple techniques to convey their story. Artists who excel adjust their drawing style to accommodate the severe reduction between original drawing and the crowded newspaper comics page. Milton Caniff has been called the “Rembrandt of the Comic Strip,” a moniker which has been repeated frequently by many authors who have only read Terry and the Pirates and Steve Canyon in reprint compilations from the original newspaper version of the comic strip. Many historians have accepted looking at his art in reproduction, which highlights his ability to spin a great yarn stand out. But Caniff was more than a raconteur; he was a brilliant artist. 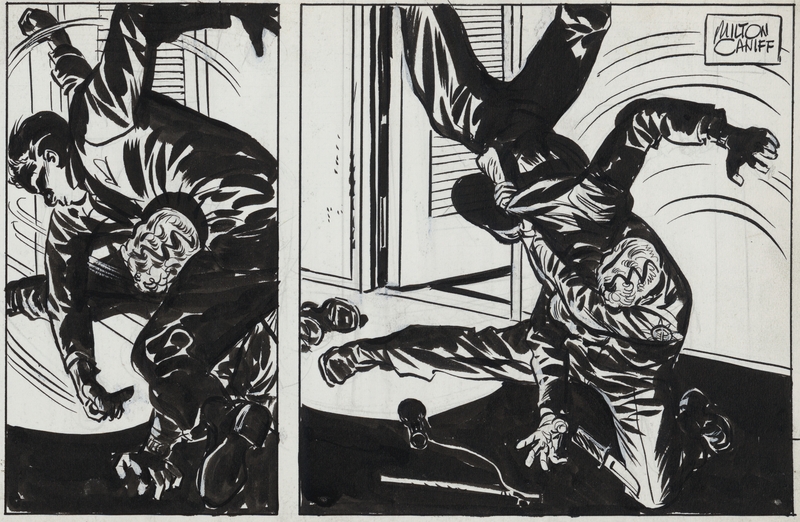 Appreciating Caniff’s mastery of ink brush and the pin for scraping out lines to create a dimensionality in his work that the newspaper page could not convey requires looking at his work in person. In Terry and the Pirates, Caniff brought the skills he had gained in Dickie Dare to fruition, using scraping out not only to redirect and control his line, and, more significantly, to create texture to the Strathmore board. 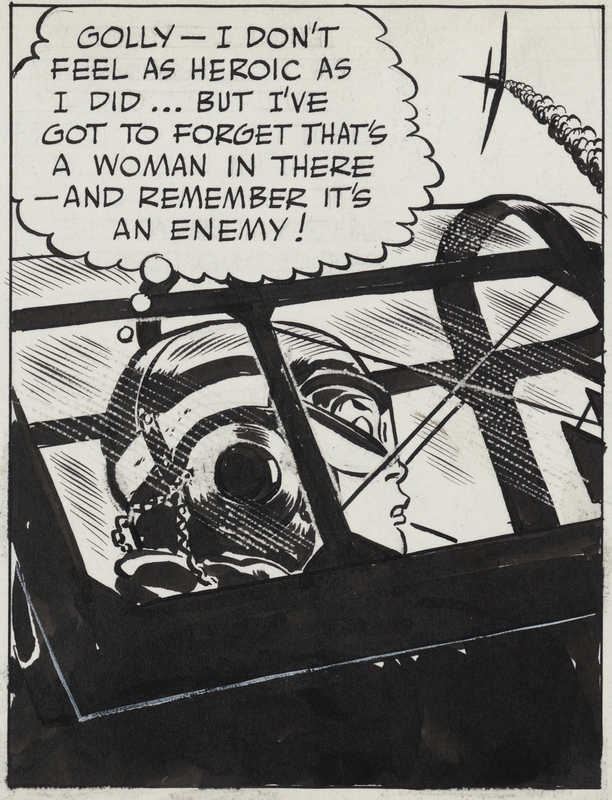 In one particular panel in a 1944 scene where Terry chases Sanjak in the air, both techniques work. Milton Arthur Caniff, artist, Terry [and the Pirates]. Come uppance coming up. These P-40’s are rugged, Sanjak…if you were in a Zero right now you’d look like a used punch board, January 26, 1944. Original drawing. Wood – CS, no. 1066. LC-DIG-ppmsca-09528, http://www.loc.gov/pictures/item/2005689634/. Art Wood Collection of Cartoon and Caricature, Library of Congress © Ester Parsons Caniff Estate. 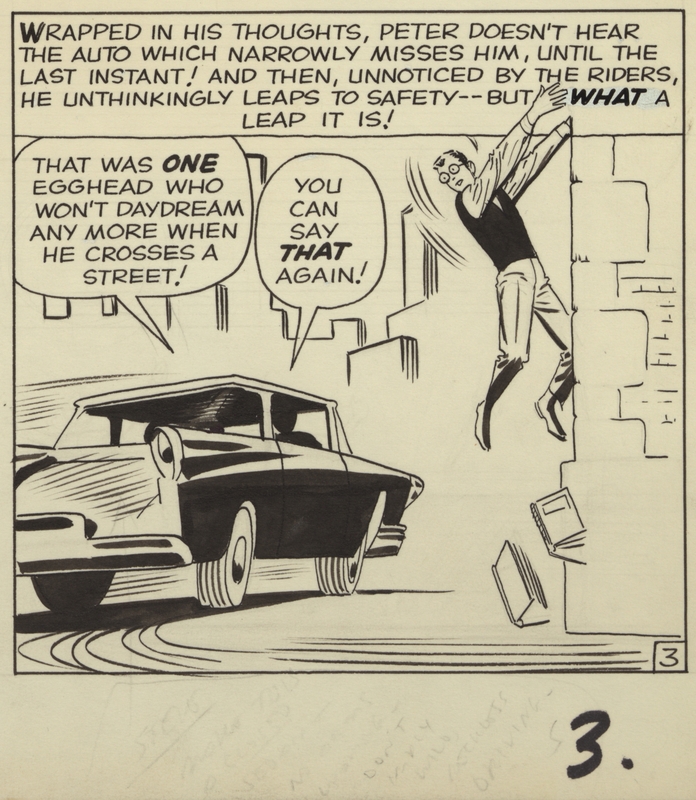 In this early Steve Canyon comic strip, typical of Caniff’s use of ink to create shadow and silhouette and his use of line to create a sense of action, one understands in looking at the graphite lines in the original, how important perspective and balance were to his composition. His dynamic scenes create active narratives which tell a story of survival in the face of betrayal in a world still simmering with post-World War II tension. Milton Arthur Caniff, artist, Steve Canyon. Payoff is increased overhead. “I’m worried ’bout Stevie Canyon, Missus Jones!”, August 21, 1947. Original drawing. Wood – CS, no. 1077. LC-DIG-ppmsca-09530, http://www.loc.gov/pictures/item/2005685904/. Art Wood Collection of Cartoon and Caricature, Library of Congress © Ester Parsons Caniff Estate. The Library of Congress has celebrated the Ninth Art as art for decades. The stroke of the pen, the scrape of the pin, and the brush of opaque white or India ink, are as important as components of the art as is the final print publication. Looking at original art provides insight into the technique, collaboration, and thought that went into creating cartoons for publication and increases scholarly awareness of the skills of the artist beyond what can be conveyed in reproduction. Sara W. Duke is Curator of the Popular and Applied Graphic Art, Prints & Photographs Division at the Library of Congress. Contact her at: sduk@loc.gov. – Selected works appear in the Prints and Photographs Online Catalog, http://www.loc.gov/pictures/, and may be searched using such terms as Cartoons (commentary), Editorial cartoons, Comic strips, Comic books, and Comic book illustrations. Cartoons may also be searched by creator or title. See also: “Collections of Works of Art on Paper in the Library of Congress.” Edited by Katherine Blood, special issue, Washington Print Club Quarterly 47, no. 4 (Winter 2011-2012):2-28.:http://www.loc.gov/rr/print/resource/Washington-Print-Club-Quarterly-Winter-2011-2012.pdf. – Internet users may access the Library via http://www.loc.gov/. – About the Foundation: Caroline and Erwin Swann Foundation for Caricature and Cartoon Web site, viewed online: http://www.loc.gov/rr/print/swann/swann_foundation.html. – Fellows – The John W. Kluge Center – Fellowships in the Humanities (Library of Congress) Web site, viewed online: http://www.loc.gov/loc/kluge/fellowships/. – The Library of Congress Web site for all online exhibition is http://www.loc.gov/exhibits/all/. – Jeff McLaughlin, ed., Stan Lee: Conversations. University of Mississippi Press, 2007, p. 92. – Jon Paul Adams, Milton Caniff: Rembrandt of the comic-strip. Philadelphia, David McKay Company ; Andrew Welsh-Huggins, “Rembrandt of the comic strip,” Beaver County Times, Oct. 25, 2007, p. B1; “Milton Caniff: Remembering the Rembrandt of the comics,” Neal Romanek – words/worlds blog, entry for August 4th, 2007, viewed online: http://www.nealromanek.com/milton-caniff-remembering-the-rembrandt-of-the-comics/. – The Prints & Photographs Division of the Library of Congress is open to the public, Mondays through Fridays, federal holidays excepting, from 8:30 to 5:00. Information on access to collections is provided through its Web site: http://www.loc.gov/rr/print/.